Now this is a TV show that I can go for. This TV show is one of those shows that once you start watching, you're not going to stop. And no it's not like the other shows that I have written about like Breaking Bad or Leverage, or even The Walking Dead. But it's a food show! Halloween Wars is a baking show where each team has three people and each team consists of a candy/chocolate master, a cake baker/decorator, and a master pumpkin carver. Now seeing the types of pumpkins that these guys carve are truly fantastic. The detail that is put into them is above and beyond. Some of the pumpkins that they even carve into are about 1200 pounds. Now that's a big pumpkin. Now take the baker. The stuff that they make out of cake or modeling chocolate is so intricate that it's so amazing to see what they can do. In the first season there us a woman who was a fantastic artist who was able to make a skeleton out of cake! You don't see this! Ever! The detail was so realistic that it would just blow your socks off. And finally, the candy man. These guys make anything out of chocolate or pulled sugar. And when I say anything, I mean anything. You will see chocolate gates. Sugar Hair. Eyes made of blown sugar. Anything can be made by these guys and it was truly amazing. Now this show will make anyone super hungry, like it did for me. But it is so worth it after you see the stuff that these guys make. After watching the interview with Tom Fontana in class i decided to go home and watch Borgia. I was especially excited to watch this show because i have always been a huge fan of film's or television series' that are based on historical events, especially those that take place a very long time ago so naturally Borgia was right up my alley. While i was watching the first episode i thought it got off to a slow start. One of the main characters i thought was acted very poorly in the beginning but then it started to pick up once the show moved on. During the interview, Tom Fontana mentioned his writing style is one in which he focuses on developing the characters first and foremost. He said the story tends to grow around them when he has decided what kind of people they are and what kind of actions they would take. I feel like this is very common for shows or films that are depicting historical events. Most of the time the plot is written in such a way that it makes you focus on the characters themselves instead of the situations there in. I am a huge fan of shows and films that are constructed in this way and Borgia is definitely one of them. Last night concluded our filming for our most recent Fiction Field project and although it was a lot of fun it was much more difficult than I expected. Having to match up the original footage with the footage we recreated was a task in itself. In the end, we were able to recreate the footage so that they were for the most part identical. I was proud of our group and the way we worked together! While surfing the web recently, I cam across this image. Now, normally I don't find myself incredibly provoked by cartoons of this sort, but this was something entirely different; this picture actually said the thousand words to me that it's supposed to be worth. In short, it asked me, "What are you doing about this? Or are you doing anything at all?" I see this picture as representing what just about everyone within the media industry's been guilty of at some point: framing a shot just so, tweaking words in the proper way, only giving half the story. As a means of communication between different areas of the world and society, this shouldn't be such a twisted message that we send; rather, we should be relaying an honest series of events and ideas, which has potential to make moves in turning the media into a perpetually reliable source. Yes, the content is still truthful, more often than not, but it's displayed out of context. For example, in the image here, the man seen running away in reality is caught in a shot that entirely switches his action, and does the same for his aggressor. Because of the way the shot is framed, however, it can still be considered an honest representation of what's going on...just with a bit of the story missing. It's like when a child is caught by his parents having done something wrong. "Did you make this mess?" they ask him, and he replies "No, Johnny did." What he neglects to mention is the fact that he aided Johnny in this action, and by doing so entirely changes the way that events proceed from that point. Still, he hasn't told an outright lie; Johnny did do this, but not alone. So, what am I doing about this kind of misinterpretation in the media, about this backhanded way of skewing ideas to make or break something else? Sure, I'm in Park and learning all that I can to accurately work with the media, but how am I actually going to apply these skills to the real world to make a difference? 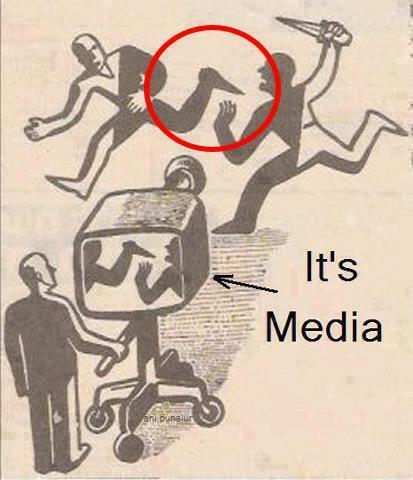 The fact of the matter is, I'm not going to do it alone, but that's what makes the media so wonderful opposite its negatives; everything connects, and there are infinite ways of getting this thought across. It's a touchy situation, considering how quick people are to jump to arms over any slight infringement of rights, but with enough influence behind the movement, it has potential to make serious progress in the way of accurate media coverage. Saturday afternoon I made an amazing decision. I plugged an ethernet cable into the back of my blu-ray player. I now have streaming Netflix on my television. Win! My roommates and I have spent countless hours since then watching How I Met Your Mother and various movies. One of the movies that showed up in the "Recommended for Breanne"(or whatever that section is called) was Office Space. Office Space is a comedy released in 1999 written and directed by Mike Judge. Office Space follows a group of dissatisfied coworkers at Initech who decide to rebel against their boss and the company. The main character, Peter (Ron Livingston), is miserable. He's also dating Anna at the beginning. Anna convinces him to see a hypnotherapist and the guy dies mid-session. This leaves Peter in a state where he's happy and doesn't care about anything. Like almost every other movie, there was a love story mixed in it. Peter ends up dating another girl, Joanna (played by Jennifer Aniston.) The humor is interesting and uses a lot of repetition in its jokes. Office Space uses stereotypes really well. They have the boss, the smiling receptionist, the weird guy, and a bunch of typically dissatisfied workers. At the very beginning of the movie I wasn't sure that I was going to like it but a friend who was over told me to give it a few minutes. I'm glad I did because I found out that it was a pretty funny and enjoyable movie. Was it predictable? Yes. Did I like it any less because of that? No. If you haven't seen it and want to sit down, watch a movie, and laugh a little, I would recommend Office Space. As we mentioned in class one day there are racing to get films done in 24 hours given props, prompts, themes, etcetera. A year ago I was watching short films on YouTube and came across one that I really liked. This one was done in 100 hours though. "Gone Goodbye" by Keith Rivers Films, LLC is a really clever and powerful piece. If I had been told that from start to finish this was done in 100 hours I would not believe it, despite knowing that Stairway to Heaven by Led Zeppelin was written in an absurdly short amount of time as well. Considering the prop was a balloon and the theme was privacy, the story was just about the best possible. It was out of the box, deep and intelligently written. From the point of view of a balloon narrating a message tied to it, there are numerous metaphors that make you want to BURST out laughing. The aerial cinematography was stunning, full of gorgeous images. One of the other main strengths was the location. Location, location, location. It fit the privacy theme and it was on a beautiful lake which I've seen other shorts done, there's something magic about that location. I would go as far as saying it's a masterpiece. This is one of the things I hope everyone would check out because you can learn a lot from it, no matter how much experience you have. Probably my least favorite George Romero movie that I've seen. The concept of the movie was this: zombies have been around for a while now (probably years from what I could tell) and are growing more intelligent. I wanted to stop the movie there. Zombies don't get more intelligent, there brain no longer functions because they don't need to breathe (so no oxygen goes to the brain). But the movie keeps going with that concept, letting the zombies function as a group, hold and shoot guns, even be smart enough to put down gasoline and then fire on top of it. The only part of that that I'll agree with is when zombies can carry out a simple function that they remember from their life as a human. Not something as complex as pointing, aiming, and pulling the trigger on a gun. However, I did like a lot of the other concepts. Keeping most of the movie blue added a nice creepy effect to it. I also like how it had a second story to it where one rich man owns a city, and lives on top of a tower while everyone else is left to possibly be invaded by zombies and live in poverty. I also liked the camera work in it a lot. The shots had a lot of variety that kept me interested despite being angry at the intelligent zombies. P.S., George Romero is my idol. That is all. This past Friday I saw The Shining for the first time. This past Saturday I saw The Shining for the second time. Throughout my first viewing I was gripped by every shot, I was captivated by every aspect of every shot because I knew that everything in the frame was there for a reason. There were no accidents in the final product. Every single detail means something. Throughout my first viewing I was also struck by how much tension and fear was created solely by the score. Scenes that would have been absolutely normal otherwise took on a sinister tone with music. You can feel yourself being drawn into the warped insane character that is Jack. The film isn't scary in the sense that it makes you jump, it is terrifying because of the implications of the actions of the characters. This film is truly terrifying, you are filled with a distinct unease and fear throughout. My second viewing was entirely different, I had read up on some of the symbolism in the movie after my first viewing and set out to see the film from a new perspective the second time around. One of the major "conspiracies" surrounding the film is the assertion that it is Kubrick's confession to faking the moon landing. I knew that there was some conspiracy regarding the moon landing but on my first viewing I didn't pick up anything. On my second viewing it became clear to me that the Overlook Hotel is supposed to symbolize America in that it is this vast space that is literally built upon a Native American burial ground, it looks beautiful from the outside but is deteriorating on the inside. Stuart Ullman is JFK, enlisting Jack to take care of this very important task for them and roping him into an extended commitment. Jack and Danny are a split version of Kubrick dealing with the pressures of faking the moon landing. 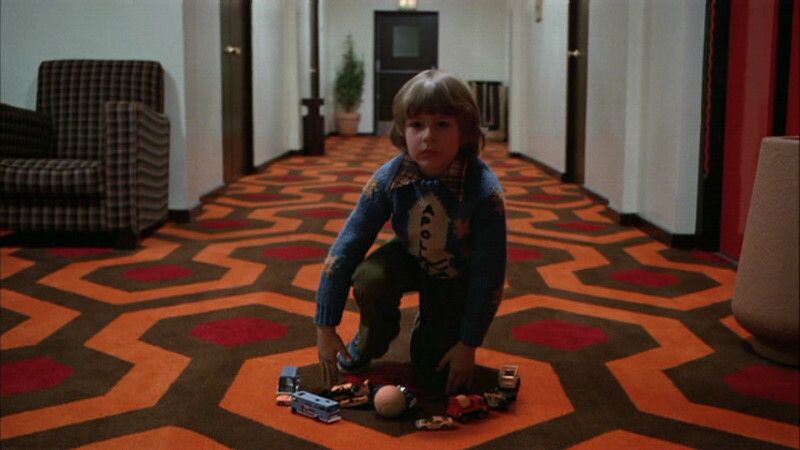 Jack is the logical side of Kubrick while Danny is the young artist who is confused and horrified by the process. Wendy is supposed to be Kubrick's wife who is just mentally exhausted and abused by the task her husband has taken on. There are so many intricacies to this film that it would be near impossible to explain them without actually watching the film. This movie is made to be thought about, there is no clear thing that everyone takes away from it. You watch it and you feel something, your perception of what happened is entirely up to you. The audience is free to give meaning to the film in their own way. I could not recommend this film more, I will be watching it again for the third time within the next few days. Futurama is an animated television series that originally aired on FOX and currently airs on comedy central. Matt Groening is the creator who is best known for creating the Simpsons. 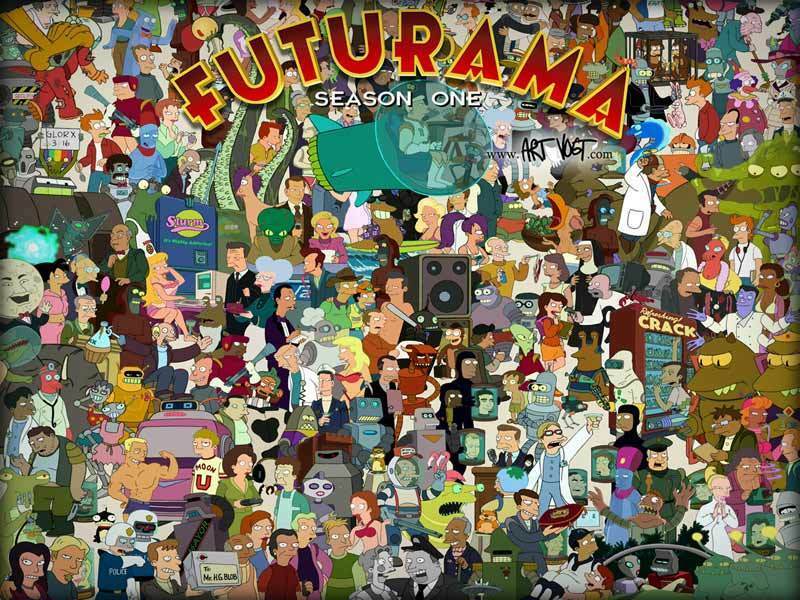 Futurama premiered in 1999, but was cancelled by FOX in 2002 and then comedy central picked up in 2009. 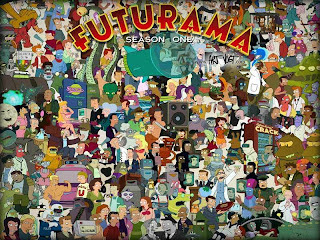 I didn't start watching Futurama until senior year of high school, but I fell in love with it instantly. My friends were the ones that pushed me to watch it and now whenever we are bored we watch it together and we never have a problem re-watching old episodes. Futurama is about a man named Philip J. Fry who lives in 1999, but he is then frozen for 1000 years leaving him to wake up in the year 2999, minutes before it turns to the year 3000. When he refuses to accept his job, he is chased by Leela who becomes a main character and love interest for Fry. He also befriends Bender during the first episode. Fry then finds out that he has a nephew named Professor Farnsworth. Farnsworth owns a company called Planet Express where most of the action takes place. There are only about seven main characters, but like the Simpsons there are many other characters who return frequently. What I love about Futurama is its abilities to have you laughing during the entire episode, only to pull at your heart strings at the very end. There are many episodes that will make you want to start crying. I think the writing is brilliant. I think this because the jokes are spot on and the characters remain true to themselves. The adventures they go on are amazing. 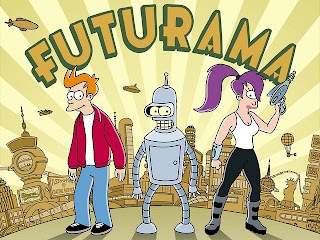 Futurama is one of my all time favorite shows and while if you compare the prime of Futurama to the prime of the Simpsons, the Simpsons might have them beat, it is still a very close call. It is a must watch show. Here is a video of one the shows best characters. While browsing Youtube earlier this week I was excited to see an early trailer for Iron Man 3. As a huge Iron Man and Marvel fan, I’m looking forward to the film’s release and hoping that it will be a strong addition to the Marvel Cinematic Universe. The trailer indicated that the film’s story is based mainly on the “Extremis” story arc from the Iron Man comics. The arc involves Tony Stark becoming infected with the Extremis virus, a serum comprised of microscopic nanomachines that “rewrites the body’s repair center” in order to have the subject become a super soldier. The results vary for each subject, and for Stark the Extremis virus causes him to develop a technological link with his Iron Man armor and to process information at an accelerated rate. The main villain of the film is the Mandarin, played by Ben Kingsley. In the comics, the Mandarin uses ten magical rings to fight against Iron Man; it will certainly be interesting to see how the movie will balance science and magic. The trailer also showed what looked like the Iron Patriot, but after reading information about the film online, I found that the suit is actually the War Machine model with a patriotic paint job. I am a lover of television from 'across the pond.' Some of my favorite 'programmes' includes Sherlock, Doctor Who, Skins, Misfits, Torchwood, Downton Abbey, Merlin, and much more. The newest show that I have decided to watch is BBC America's first original scripted series called Copper. Copper is a period drama that follows an Irish-immigrant detective in New York City during the American Civil War in 1864. Detective Kevin Corcoran, the lead actor played by Tom Weston-Jones, tries to bring peace to the 'Five Points,' a neighborhood notorious for being plagued with disease and crime. He is skilled in the science of deduction (much like Sherlock) and carries swift justice to those who have wronged the city or someone he loves. In the first episode of the show, which is unfortunately the only one I've been able to see since I only started the series last night, Detective Corcoran displays a father-like affection for a girl from the streets named Annie. She is one of the young girls that has been corrupted by the Five Points and has had to resort to pleasuring men for a living although she does not look more than twelve years old. The detective uses his skills of deduction, and the help of his friends, to find out who has murdered and raped Annie's twin sister post-mortem. Although he tracks down the killer, the man responsible for her death was a wealthy and powerful man in society so he was not punished in the slightest and another man, who learned that he was going to die very soon anyway, volunteered to take his place at the gallows. Detective Corcoran is frustrated with this outcome and the murderer's wife has even asked for Annie's sister to be avenged. I am curious as to how this will play out. Besides having an intriguing story, Copper has great cinematography and art direction. I throughly enjoyed that the show was mostly shot with a shallow depth of field. I actually commend the focus puller for a job well done. This person clearly knew the blocking of the scenes and could predict movement, took the emotional tones of the scene into account, and excelled in difficult rack focusing situations. This element definitely helped advance the story. And of course the costumes, set decoration, and props were also spot on for that time period. It was beautiful to watch. I am excited to continue watching this series. I am thrilled that it has been renewed for a second season. Although BBC America isn't available to most viewers unless they have a subscription, the series premiere brought in 1.8 million viewers, the highest-rated series premiere and highest-rated drama series for the channel. I can't wait to watch more! 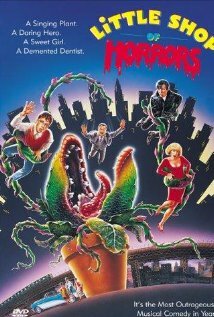 I'm going to go ahead and assume that some, most, or hopefully all of you have seen the movie Little Shop of Horrors. This is a great film directed by Frank Oz, who has a pretty outstanding resume. Some of you may know him as a puppeteer and voice actor for The Muppets, or the voice of Yoda in Star Wars. He does not have much of a directing background, but this hit movie has been deemed a 'cult classic,' which is good, I think. But, where did this all start? Way back in 1960, a man named Roger Corman directed and produced a movie in only two days. For those of you keeping score at home, thats a 70 minute feature-length movie that was shot in 48 hours. This was the last two days before the set that was used was to be taken down, as in the previous 5 days, Corman had just filmed another feature-length movie called Bucket of Blood. Wait, what?! That's right, Corman shot TWO movies in ONE week. Mind you, these were very low-budget films, and not highly enjoyable by today's standards, however I still find this a great feat. So I guess to get his money's worth out of the set, he decided to film a second movie rather than let the set go to waste with its final two days. Somehow, they wrote a script and shot the entire film in these two days, and the result was a far-fetched, quirky, interesting, and entertaining film. It even features a very young Jack Nicholson in his third Hollywood role he had ever played. Next, this odd little movie became far more popular than they ever anticipated it to be, and years later (1982), a man named Howard Ashman adapted and wrote it into an off-broadway musical. Again, this production became far more popular than anyone had ever imagined, and was quickly re-adapted to film in 1986. This is where Frank Oz picked it up and made it into the film everyone thinks of today when they hear of Little Shop. Oz's rendition kept the stage style of the musical by using a limited number of sets, and lengthy wide shots, which Oz refers to as "master shots". One of these shots includes a ginormous crane up while a character runs up a flight of stairs mid-song. Unhappy with the first 31 takes, the 32nd was finally used. Anyways, this film had quite a historic journey before it came to be what we know today. Also, with the success of Oz's movie, the stage musical was then picked up by Broadway. I can't decide what part of that history that I find most fascinating, but it does put into perspective how one seemingly small production can become such a big phenomenon. and it's lack of classes devoted to how the industry and business works. I first thought of this when we watched that video in class on Wednesday. Now, I know Arturo has told us certain things about the industry and how production is the best way to get into the business but it was interesting to watch the video and see the vast number of positions available in just one department on set. I was really amazed that I had never really thought about that kind of stuff because knowing the business and its positions are extremely important as well as how the hierarchy works on a set. A lot of times, we only learn production type things in park and I think because of this, we forget that learning about the industry we get into and how many of the different things work is extremely important. I really wish the school would create a class or two other than the intro media industries class that students could take to learn in depth about how the industry works in different aspects. Some things they could talk about would be how to get investors for films, going through all the production jobs on set of a movie or television show (field, live, sports, scripted, ect. ), all about the different studios and how to get in contact with them, and even the different areas in the country and around the world that are hidden hotbeds for video other than LA and NYC. I think this would be extremely beneficial for students to really fully understand the business other than only knowing how to produce things. I have never seen the movie Castaway up until last night, but before that I remember learning about its sound track and how it was only composed of wind, water, and wood. Up until actually seeing this movie I really didn't have any appreciation for this random fact that I knew. However upon seeing the movie I have a new found appreciation. I just assumed the audio was in the background and was no big deal, but now I see that for a good portion of the movie, background audio was the main source of the scenes. Most of the scenes involve little to no dialogue and if there is any it is just Tom Hanks shouting at his friend Wilson, who is in fact a volley ball. Most of the time it is very long shots meant to capture his emotion as he faces his situation or comes to a realization to his survival. All of these long shots however are complimented by strong audio. The constant sound of waves or the whistling of a strong wind really completes the movie. It is the second half of a being that alone would be useless and unusable. So you have to give credit to the audio crew and the work that they put in to only use very basic natural sounds to create the environment in which we would spend the next hour of our time in. He has made trailers for Knight and Day, Easy A, Dinner for Schmucks, and many other great movies. A talented guy, Brando is following his dreams here at Ithaca College to work with movies and create great films that will draw the attention of audiences everywhere. The Kenya video above is a music video with the music Baba Yetu by Christopher Tin. Brando used a Canon T3i and shot this when he went to Kenya to explore and experienced many animal sightings. Brando's trailers were also shot using a Canon T3i. A process he loves, Brando loves to get to the movies early to see the trailers to get ideas for which ones he wants to shoot next. Brando uses his own cast and crew and will often make appearances in his own trailers. There have few trailers in which Brando has had random appearances from Hollywood actors like Dylan Baker http://www.imdb.com/name/nm0048414/ and Alan Rickman http://www.imdb.com/name/nm0000614/. If you want to see more of Brando's work, you can go to youtube and type in BBB pictures and click on BBB Pictures "Trailers" Remakes. Everyday we see commercials and advertisements, some brands even have advertise on the product its self. Too often we just read/hear/see these new wild promises and take them for true, but how much actually needs to be true? What brought this whole idea up for me was when I was watching a television commercial and the host said, as all hosts do, "just listen to this satisfied customer" and cue cut to random guy saying how much he loves the product…but wait I noticed just visible on his white shirt was white lettering saying "paid actor." I was just told he was a customer? I think it is interesting how as long as a disclaimer is added companies can get away with purposefully misdirecting their audience. I wanted to look further into this and looked to the generic model of the "NEW AND IMPROVED" slogan used by so many companies. After researching I found that "new and improved" is one slogan that in almost all cases increases overall sales to consumers. However what does "new and improved" really mean? I found my answers after some research, it means nothing. "New" can pertain to anything about the product, it has been watered down, the packaging is different, the color of the box has changed, you get less for your money, anything. "Improved" on the other hand is a matter of perspective so I could say the taste has improved, or the colors have improved, or the seller's profit has improved. All of these claims are geared to take advantage of the consumer and purposely misdirect them, however companies can get away with it as long as there is a disclaimer or are vague enough to find a loophole. I suppose the moral of the story I learned from my research was that we, as consumers, must be more skeptical about the claims made by companies and their products and that (unfortunately) it may be up to us to decipher truth from fiction when it comes to advertisements. Recently I saw the new Tim Burton movie Frankenweenie and before I even start to say anything I want to say this; I did enjoy the movie. I thought that it was a delightful homage to the old monster movies of the 30's and 40's and I loved the feel of the movie. However, I couldn't help but feel a little let down when I left the theatre. Now I'm a huge Tim Burton fan. Ed Wood and Sleepy Hollow are among my favorite movies of all time and it was nice seeing him return to form for Frankenweenie, especially after Alice in Wonderland and Dark Shadows. It was nice seeing a more gothic movie more in the vain of Corpse Bride which is also a movie that I really enjoyed. 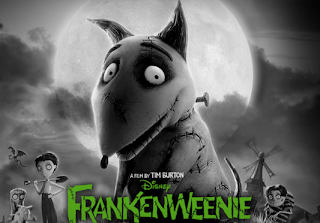 The movie is about Victor Frankenstein. A young kid who spends all of his time in his attic making various inventions and gadgets all in the name of science. His only real friend is his dog Sparky. One day however Sparky gets hit by a car and he dies. Victor becomes absolutely devastated and decides that there must be some sort of way to bring his dog back. So after a very Frankenstein like experiment sequence, Sparky is back from the dead and from here the movie really begins. Now like I said before, I did enjoy this movie but I did have some problems with it. The first being that I really don't feel like I connected to any of the characters. With the exception of Victor none of the other characters really stood out for me. It seemed like their only purpose in the movie was to do something dumb that progressed the story further, that was about it. Another problem I had was that I felt like it was a little too preachy in certain parts. The movie is about science and how people view it. The town is represented as a very sheltered town that is absolutely terrified of science and all of the questions science raises. Typically I wouldn't mind something like this but there is one scene involving the town at a PTA meeting and they demand that the new science teacher explain his teaching methods. The following speech seemed a little too preachy for me and I felt that Burton was definitely hinting at a lot of other things with it. My final issue with the movie was that I honestly felt like it wasn't Tim Burton enough. Burton is the kind of guy who really understands character. He loves to do movies that involve a crazy or eccentric type of character because he understands them and portrays them so well. In this movie however I felt like he didn't do that enough. I think that with the character of Victor he did a pretty good job but like I mentioned before, the other characters just seemed too boring for my taste and because I know it's a Burton movie, I know that he could have done a better job with it. Ok, so I'm sure that seemed like a decent amount of criticism but I would still highly recommend this movie. The atmosphere is great, the black and white adds so much to the movie and I mean, it's very enjoyable. There are funny moments, quirky ones and touching ones. Even though I think that all the other characters were forgettable, Victor isn't. This is the one character that Burton really put a lot of heart into and it shows. When it comes down to it, this movie is really about a boy and his dog. It brings you back to a time when that's really all you needed in your life to be completely happy and the movie leaves you feeling like that again. So when everything is all said and done, I would say go see the movie. It's a wonderful homage to all of the old monster movies of the 30's and 40's, it's enjoyable and it's a lot of fun. Also just in case anyone hasn't seen anything for this movie, here's the trailer. Enjoy. I love reading books. All kinds of books. I have had this passion for since I was probably 9 or 10, but it wasn't until tenth grade that I discovered a passion for creative writing. One of my closest friends in High School did a lot of fan fiction and wrote her own short stories, and because I love to read, I was her captivated audience whenever she wrote something new. It was during this time that I thought, "Hey! I should try to do this!" And so I did... only I wasn't as successful at first. I think I have around five or six stories that I started writing or have notes on that I just never finished. I guess I just never realized how much went in to telling a story: Characters have to be discovered and developed, the plot should twist and turn in ways that are both unexpected, yet make sense, research has to be done in period pieces, etc. This is true for novels, non-fiction, screenplays, and theatrical pieces. I tried to write my first mini-script for the stage just before my sophomore year in high school. Let's just say it wasn't the best piece of writing I have ever done, and I didn't really enjoy it. I have taken several creative writing classes in both high school and college that I have absolutely loved. Right now I am even working on a novel that I started in a class that I took last fall. It will probably be a long time until it is finished, because the more I write the more I find out that I need to still do more research. Since I was so unsuccessful in playwriting, and I loved creative writing for novels, I thought that was the only writing I would or could ever do. Hence why I was so nervous for the course Developing Story Narratives that I took last semester. It seemed a little rocky in the beginning of the semester. The first couple practice scripts seemed to be going okay; they weren't great, but at least they were ten times better than the "play" I tried to write when I was a part of the Hanger Theatre summer camp. For the course we had three major scripts to write: a story based around an important event in our own lives, a story based on a character that we create, and a story centered around a theme. The first one was okay. I based it on the events that took place during and after my grandfather's death. The second one, I fell in love with. It is a story based on an orphan named Henry who is, in many ways, searching for a place where he belongs. I won't go into too many details, but this piece turned out fairly well, to the point where I would LOVE to film this here at Ithaca College. I want to do it right though, and the first step is making sure the script makes sense. Currently, I'm in the process of changing around a couple of scenes because the events that occur don't quite fit. The interesting thing about writing a script versus a novel is that you have to keep in mind that you are writing for a visual medium. Every emotion or internal dilemma has to be able to be seen in some way. It would be easier for a writer if subtext could scroll across the bottom of the screen, but then it wouldn't be much fun for the audience. Besides, sometimes there aren't words for certain emotions. On top of all this, the character has to move or flow from one point to another in a way that makes common sense. This means looking internally into the character to decide what is exactly going on there, so that the actions don't seem forced. Details, details, details. They are so important in creative writing for novels. 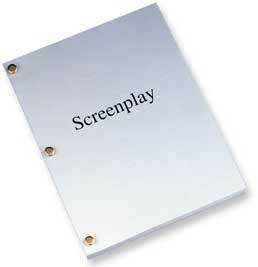 Not so much, or at least not in the same way, for screenwriting. My professor said that you have to imagine each line as a shot in the film. That is a lot harder than it sounds. Well, I will keep plugging away at it and hopefully I will find the best way to tell Henry's story. Freddie Wong and Brandon Latsch are one of the giant success stories of youtube with their channel "Freddiew". By uploading weekly, quality content, these guys make a decent living in the harsh playing field of the internet. Averaging around three million views per video, they manage to reach a huge audience of both subscribers and random internet viewers. But, how do they reach such a large audience? Well, through this article they discuss exactly what it takes to become successful on youtube. It discusses what content becomes successful and the importance of consistency. Along with these main points, it also brings up several other reasons why it is so important to upload on a consistent schedule. Overall, this article is an invaluable resource to anyone considering a career in online filmmaking. I recently started watching interviews on makingof.com, a website I didn't know about until Arturo mentioned it in class. In an interview with Joseph Gordon-Levitt, he is asked about his company hitrecord.com and gives advice that I believe is the main focus and goal for Park students and should be my mindset. JGL says his advice starting at the 2:50 mark. He basically says that in order to be known, you don't have to move to LA, get an agent, and know people. He believes that you need to create an idea, go out and make something, and try to get it out to people. He uses the example of someone who had no agents, created a film, and was able to show it at Sundance. I think this interview with JGL is extremely valuable in terms of advice and insight into the movie industry. I've been saving up for a camera, possibly the Canon T2i, and I've been writing short skits and stories that I plan to create. Honestly, I've been slacking and like Arturo said, there's no reason why we shouldn't be creating something new every week or so. I'm also working on a script for a mockumentary that I want to film over Thanksgiving or Winter break. I used to make movies every week when I was younger with my friend Jason, a BU communications student, and we're collaborating again and hope to create the mockumentary. Also, check out www.hitrecord.org; JGL's website that features work from artists, filmmakers, and beyond. Maybe you can sign up and share your work there. 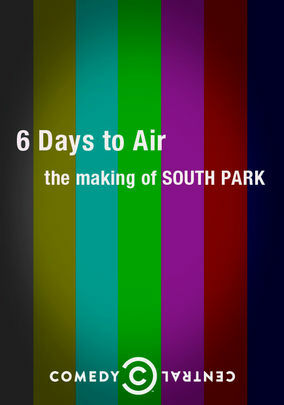 6 Days to Air documents the making of a South Park episode from start to finish. This hour long documentary produced by Comedy Central on the animated cartoon introduces us to creators (and voice talent) Trey Parker and Matt Stone as well, detailing their creative habits. First animated with cardboard cutouts in stop frame, South Park took sometimes weeks to produce in its early days. Shows like The Simpsons and American Dad take months in production. 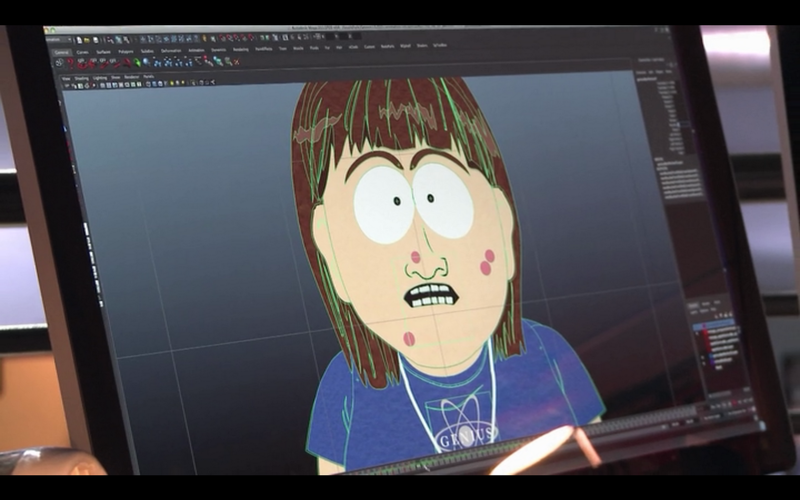 South Park now takes as little as 6 days to produce, now using the power of computers to speed up the animation. It's how South Park remains the most relevant and topical animated show on air. Even though it's done in a 2D style, it looks like they are using AutoDesk Maya to accelerate the production process. The documentary takes us through the writers' meeting. SNL's Bill Hader, a couple of other writers help out Parker and Stone develop ideas and a story. Trey Parker is then responsible for the bulk of the script. Co-Executive Producer Anne Garefino also sits in during the writers' meeting to help communicate ideas to animators and to serve as a gauge of ridiculousness/offensiveness. It's really very interesting watching such a stressful weekly production schedule produce such quality shows. It's the industry we are going into and it's nice to see actual production, instead of just the glossy end-product. Last night I watched the film The Siege starring Denzel Washington, Bruce Willis and Annette Bening and it was ok. In a nutshell Denzel is on his A game (as usual), the supporting cast was alright, and the story was creative and fueled by action and conspiracy theories. Unfortunately, The Siege's plot was let down by poor writers as the dialogue did not do the story justice. Also, after Wednesday's class I found a flash drive on the floor! So if you're freaking out don't worry, it's in good hands. 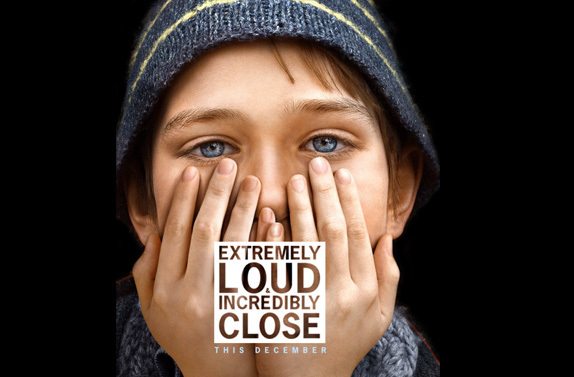 Last night I watched the movie Extremely Loud and Incredibly Close. It had been on my list of movies to watch for a while but I have been so busy that I never got around to watching it till now. I wasn't really sure what I was going to think about it but I knew it was going to be a somber story because of its ties to 9/11. There's never really a "right time" to watch those kinds of movies. You can't really avoid getting emotionally attached to characters or stories involved in it. I don't want to give anything away but it is about a boy who is looking for clues left by his father who died when the World Trade Center collapsed in 2001. It is a very simple story, yet it all seems real. All of it could happen in real life, and for all I know it could have happened. There are so many small things that just add to the story and details that make it that much better. I thought the acting by Thomas Horn (who plays the boy, Oskar) was phenomenal. I looked him up and he has not done much acting previous to this and he just played the part perfectly and got into everything and actually lived the life of the boy whose story was being told. I would highly recommend watching this movie at some point. It really hits home because all of us were alive during 9/11 and we all have our own vivid memories of what happened that day. Even if we weren't directly affected, we know someone who was and we know how it all feels. So it is definitely worth a watch. Earlier in the year I wrote a post about Game of Thrones as a television series. In it, I mentioned my general dissatisfaction with books and their movie adaptations. After reading Perks of Being a Wallflower by Stephen Chbosky this summer, I was excited for the movie, but I was also preparing myself for the inevitable letdown afterward. The movie has a few of my favorite actresses, from my guilty pleasure, Nina Dobrev, to in my opinion, one of the most underrated actresses in Hollywood right now, Mae Whitman. The movie also totes the name of Emma Watson. The movie was released to select theaters, so I had to wait a while to get the chance to see it until I went to Boston for fall break. Within the first minutes of the film, all my fears had been wiped away. The author of the book, Stephen Chbosky wrote the screenplay for the film, as well as directed it. This meant it was his vision through and through, something that is so rare in book to movie adaptations. If there was ever a doubt that someone could do all three, it was squashed. Chbosky wrote Perks of Being a Wallflower through the main character's letters to an anonomous person. I really liked that Chbosky kept that in the film with pieces of narration scattered throughout the moive. Narration in general is very hit or miss in movies, but in this case it worked seamlessly into the story, to the point where you forgot that it was even happening at some points. If you came out of reading the book, not quite knowing what to think or say, chances are it'll happen all over again...and if you are prone to being a bit of a sap, I'd recommend a box of tissues. I loved that every ounce of the story was preserved, nothing was sacrificed for cinematic effect, and nothing was held back either. The heavy nature of the story was allowed to stay, and Charlie's blackouts were beautifully woven in. The film worked around a lot of the more gory scenes in the book by cutting out at just the right moment. You were never left wondering what just happened, but you also weren't overwhelmed with blood. The acting was brilliant. Emma Watson's American accent left something to be desired, but you can tell she improved as filming for the movie occured, on account of her accent was better in some scenes than others. It was never bad, but if you were paying attention, it definitely wasn't perfect. 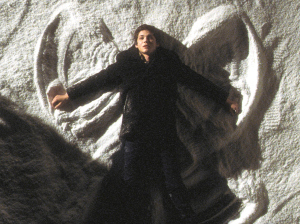 Logan Lerman, who played Charlie, did a fantastic job at playing the quiet, thoughtful character. He did a great job at playing a thoroughly awkward character without being annoying about it or trying to hard. However, Ezra Miller who played Patrick was the standout performance. You believed every ounce of the character, and you couldn't help but love him. His chemistry with Watson was perfect for their brother/sister role, and watching him strut around as Dr. Frank 'N' Furter was just an added bonus. While the movie itself is not the best movie I've ever seen, it's pretty close; it's definitely the best book adaptation I've ever seen. It does all the things a movie should make you do. It makes you think about things. It makes you appreciate what you have, while also making you feel just about every emotion you possibly could. I definitely recommend seeing it. No, this isn't about zombies. Sadly it's been a busy week so I haven't had time to find a new zombie movie to watch. I'm one of those weird people that can say I love commercials. I want to help make commercials, whether it be for television, internet, or ads placed in magazines. Although my favorite is television commercials. I love the challenge of getting a message across in only 30 seconds, and trying to add humor into it if possible. One of my favorite commercials is for Toyota Tacoma, with World of Warcraft in it. I have never played World of Warcraft, nor do I understand it, but I still think it's hilarious how they incorporated a truck commercial into the game. Another one of my favorites is the E Trade commercials. The way they are done is hilarious, gets the point across, and is one of those commercials you just enjoy watching. A few weeks ago I posted about my favorite movies the Evil dead movies starring bruce campbell. well I stumbled upon information there was a remake on the way so I had to find a clip which I did. it looks like the movie has taken a very serious turn and will no longer be the comically over the top film I have come to love. but I want to keep an open mind. maybe this trailer is just doing a really good job of making it look like it is a serious movie but it is so serious it is comical. ill watch this movie the second I can more or less hoping for a Bruce Campbell cameo if he has a cameo in it and the rest of the movie is a disappointment I will still consider my time spent well. Once upon a time when i was a senior in high school i decided to take a class called filmmaking. It was a full year course and for the first time in my high school career i could choose whichever class i wanted to take. Considering my chosen career path this choice was a no brainer. The way the class worked is the first half of the year was dedicated to film history and the second half was dedicated to actually making films. I thought the first half of the year was going to be awesome until we started watching really old movies. When i say old i mean it took us two months to finish watching the first moving images ever recorded. Then we moved on to silent films. I thought it was boring and i was not really that excited but then we watched Safety Last. Watching one of Harold Lloyds most well known works changed my feelings towards old movies forever. The entire film is great. What really did it for me though is the infamous clock tower scene. During that scene i was losing my mind. Watching him climb up the entire thing was extremely scary. The entire time i was watching that scene i was just thinking about how the hell did they actually film this? Harold Lloyd literally climbs the entire tower by himself and you can actually see how high up he is. I learned later the way that they accomplished this incredible shot. The way they did it was building different sections of the building and then having him climb up each individual section, never having to be more than 15-20 feet off the ground. The entire movie was incredible but this scene is what really did it for me. After watching that, i had a newfound appreciation for silent films. Anything that could evoke that kind of emotion in me while also not saying anything is incredible as far as im concerned. This isn't what started my love for movies but this started my new found love and appreciation for older/silent film era. Why Am I In Media? A lot of friends and family at home always used to ask me "What got you interested in radio and television?" or "Why are you a TVR major." Some people think it started in high school radio, others when I was honing my craft at a tiny bench in Brandywine Little League. It certainly wasn't the hours I spent speaking into a tape recorder in front of the television. I haven't told a whole lot of people this, but I owe everything to Black Entertainment Television (BET.) I never had a ton of friends growing up in an inner city elementary school. I always heard the other kids talking about some new music video they saw on 106 and Park. One afternoon, in an attempt to be cool, I decided to switch over to Channel 33 to see what all the fuss was about. Rather then pay attention to what everyone in my school thought was good music, I was completely blown away by the editing and choreography of the hip hop music videos. It got to a point where I was addicted. There are a few in particular that specifically blew my mind, which I posted below. I personally think music videos are the hardest thing in media to produce. Most of them have a lot of quick cuts. 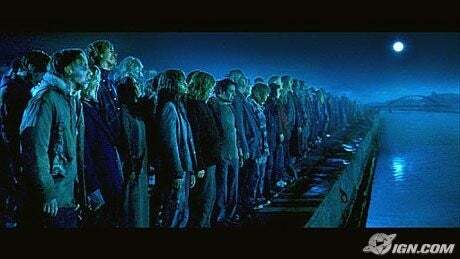 The singers often have to double as actors, mouthing the words of the song at the exact pace it was recorded. Hip hop videos are especially tough, as there is often a lot of fast talking and interesting lighting techniques. I realize now that most of them aren't very well made and have obvious flaws, but I thank the BET channel for helping me choose a career path. So a few months ago an idea came to me. It may not have been the best idea back then but after seeing all of these videos that Arturo has been showing us, I think that I may actually decide to put it to work. However, I know there are a lot of copy right stuff so that's why I was hoping I can get some input from all of you. The idea that I came up with was to write the script to the second League of Extraordinary Gentlemen. Now I know that this won't be easy what so ever, however, it's always been an idea of mine to write a script relating to another movie. Like, one idea I had happened to be to write the script of how the Joker became the Joker in the Dark Knight. But after thinking about that one, it would be too difficult only because of the fact that there would be different versions because of the comics that featured him as well as. After realizing that it would just be too hard, I scrapped the idea until now. I have always loved the Joker since I saw him in The Dark Knight, but in order to do this script I want to make sure I am not doing anything wrong with the whole copyright stuff because if it's good enough maybe I would actually try to bring it to someone who would possibly want to do something with it. Now I know to some people this may sound ridiculous but I am willing to try and give it a shot because it's always been an idea of mine to do something like this. So I either want to do the League of Extraordinary Gentlemen second movie or write a movie on how the Joker became the Joker. I know they are on total opposite ends of the spectrum but I want to try and I want some input from you guys to know what you think. 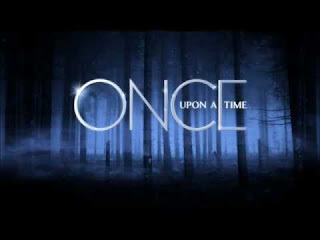 I know I've posted about the TV show Once Upon A Time before, but this time I want to talk about the musical score of the show, so it'll be different and really cool, I promise. 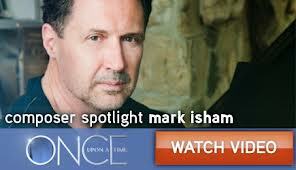 Mark Isham is a composer and musician in Hollywood, and he's been working for over twenty nine years in the industry. He has won both Grammy and Academy Awards for his score on the film Crash in 2004, and has both written and performed music for over 100 films to date, including most recently, The Lucky One starring Zac Efron. In addition to his film work, Mr. Isham has also composed for television shows such as Once Upon A Time. The executive producers and creators of the new ABC series, Adam Horowitz and Eddie Kitsis, were big fans of Mark Isham after hearing his work in so many films and asked him to be the composer for the show. 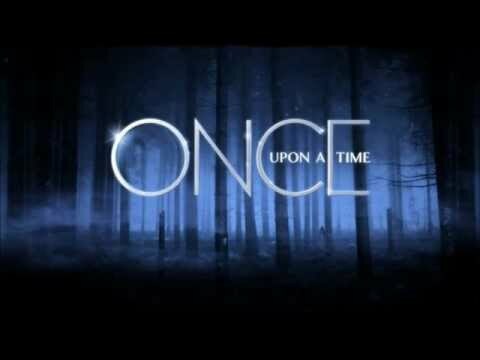 This past February, Mark Isham and ABC Studio released the Once Upon A Time (Music from the TV Series) EP. The soundtrack features the four main orchestral suites from the series, including the aptly named "Once Upon A Time Orchestral Suite" and "The Queen's Curse" which are two of my favorite scores used in the show. So for the project I was working on over fall break I needed to rent some equipment that PPECs did not have. I needed to rent a fast lens that would work on an EF mount. I’ve had my eye on the 50mm Prime in the L series, with an f-stop of 1.2. So I made a reservation online and was going to pick it up in the city on Thursday. I got down to the building and from the outside it seemed to be like the stores that sell knock off electronics. They were very efficient when I got there, and were able to guide me to grey cards and I was out in five minutes to ride the elevator to pick up the lens. Upon exiting the elevator I realized that this giant rental company was PPECs on steroids! They had about six people at the register, and at least a dozen people running around getting people’s orders ready. There were super 35s, cinema lenses, lighting, anything your heart could have desired, and it was better than Christmas. And then I just got the $1,500 lens. But it was amazing! They seemed slightly less organized than PPECs, but have more customers and way more equipment to go through. Anyway, I don’t have anything to complain about, they were super efficient and got the job done at an extremely professional level and I will definitely use them in the future again. Are You Kidding Me? REMAKES!